These saws can cut through 4cm thick stone. The 3hp can cut 2cm "Absolute Black" granite up to the incredible speed of 10 ft. per MINUTE! Simple and strong, the blade cuts next to rail so setting up is fast and easy. No gauge, shims, or offset measurements are needed. The 5hp saw itself, weighs only 68 lbs. which makes it easy for a single person to lift and move. The reduced weight also minimizes risk of cracking narrow or thin pieces of material. This rail saw is truly amazing and is considered by the experts to be far superior than the competition in performance and ease of use. Fastest cutting portable rail saw on the market today! 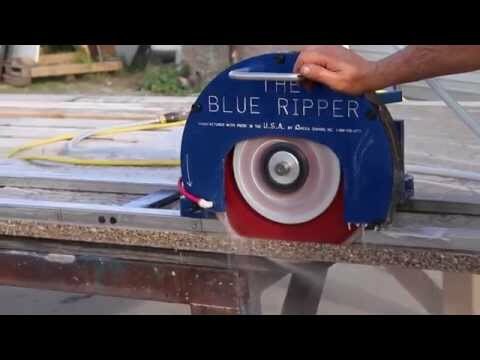 Finding that there were no inexpensive, light-weight 5 horse motors available to us, we decided to build our own: this 5HP water-cooled motor is the core of our new 5hp high-speed (3450 RPM) Blue Ripper rail saw. The water that you are already using to cool your blade is fed through custom end-caps manufactured right here in the USA to cool the motor. We incorporated everything we've ever learned in sealing and protecting the motors from the wet environment of sawing stone into these new motors to make sure they provide both the power and the life we demand from our saws. This saw requires single phase 220-240 volt power, and easily cuts through 4cm thick stone in one pass. Please note that if you cut a lot of extremely hard material, such as the volcanic browns or natural quartzite, the 3HP saw may be a better fit for your business due to the lower RPM and compatibility with a wider range of blades. Man-made "quartz" material is not an issue with any of our saws. If you just simply need the fastest Blue Ripper Sr for taking your production rate to the next level, this is your machine! The 3hp is our work horse. It spins at 1750 RPM allowing for a wide range of blade options. This saw has an amazing cutting speed of up to 10 feet per minute. This saw requires single phase 220-240 volt power, and easily cuts through 3cm thick stone in one pass. DO NOT GREASE MOVING PARTS. Many of our customers have thought that greasing the saw's threaded vertical adjustment shaft or rear hinge pivot will help with the operation of the saw, and it does - but it also heavily reduces the lifespan of those parts: the granite dust combines with the grease to create a highly aggressive lapping slurry that will wear the parts at a very fast rate. If you must lubricate the machine, use a dry spray-on lubricant such as a Teflon or Graphite spray. 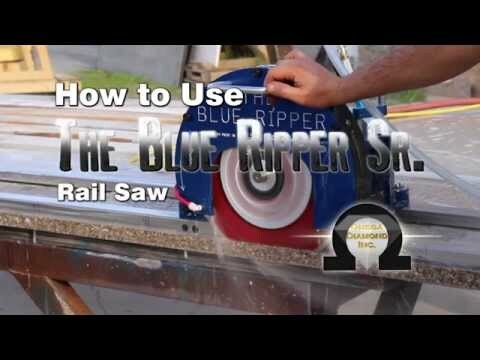 You are purchasing a saw WITHOUT rails - Please note that this saw requires Blue Ripper Rails™ to operate as designed. If you need rails, please see the Blue Ripper Rails™ page and call us to order. Wrench for Blue Ripper Sr. Weight: Only 68 lbs (5hp) to 79 lbs approx. on (2 and 3hp) models! 5HP: 14" Archon Granite Blade. 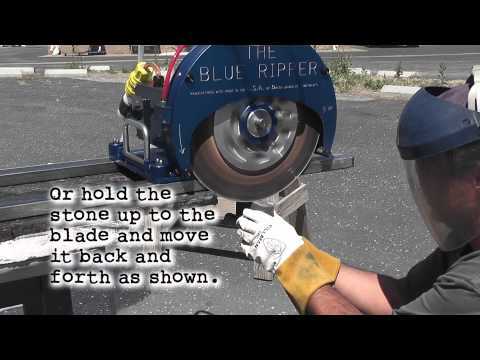 This blade is the best we've found for the 5HP Blue Ripper Sr: rigid, clean, and fast. Note - Our Rails are made of 304 stainless steel not soft aluminum. And they are one continuous piece!! Not some flimsy bolt together!! Sold separately.